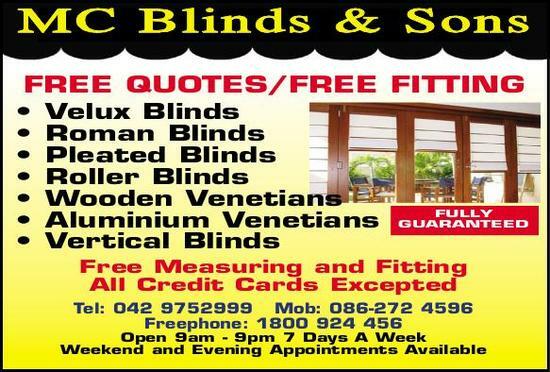 The company is owned by Michael Conlon who started his career back in 1989 selling blinds for an English based company; in 1996 he founded his own company MC Blinds employing just 3 people, at the height of the building boom he employed up to 18 people. We currently employ 10 people all based locally. We offer free measuring, advice and fitting with all our blinds. Repairs can be carried out as we usually have all the componts to manufacture all types of blinds. We supply blinds to retail and trade and commercial sectors. You are cutting out the middle man when you deal with MC Blinds along with getting the best service available in the industry. We can manufacture and fit blinds within 2 days or sooner if needed. Located just outside Castleblayney, Co. Monaghan we manufacture a wide range of blinds so if your window is unusual shape or size we can manufacture it. 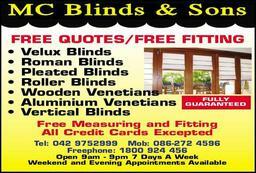 We have recently revamped our showroom were you can see and operate all types of blinds.